Dust Control Technology, a renowned provider of open-area dust suppression systems, has introduced a family of adjustable mounting brackets for the popular DustBoss® DB-RTM series of dust suppressors. Developed in direct response to customer feedback, the new bracket design is available to suit the entire range of ring sizes from 17-100 inches, and can be installed in about an hour. The DB- R is engineered specifically for use at conveyor discharge points, designed to create a virtual ‘curtain’ of mist around the material flow for outstanding particle containment. First developed for a coal application, the DB-R fully encircles the discharging material to apply suppression directly as the flow exits the conveyor. With no moving parts, the simple yet effective engineering delivers focused dust suppression on a continuous- duty basis, able to capture fugitive particles on radial stackers and other offloading points with a durable, intrinsically safe design. 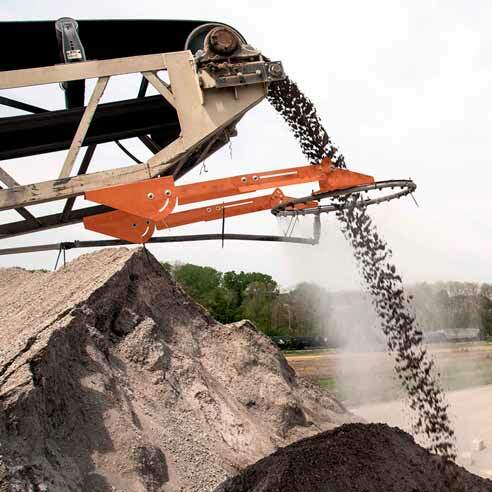 The solution is straightforward but effective, and customers are finding that it’s well suited to conveyor discharge of sand, aggregates, biomass and other traditionally dusty materials. The DB-R is currently available in nine standard sizes (17–100”/43.2-254 cm) in diameter. Available options for the DB-R include a booster pump to elevate low water pressures, a variety of nozzle sizes/configurations and water filtration. Customers can also order the units with a two-way valve and/or hose included. Dust Control Technology is a major provider of dust management solutions, with expertise in demolition, scrap and recycling, mining, coal handling, steel/slag, ports and shipping. The company specializes in atomized mist technology, with its focus on equipment for dust suppression and odour control. All of the firm’s R&D, experience and expertise is centred completely around those applications, and its staff helps customers analyse particle sizes, working environments and other factors to ensure effective performance under real-world conditions. DustBoss units are far more effective and efficient than manual spraying, with some customers realizing payback in less than six months. With customers in 35 countries on six continents to date, DCT equipment carries an industry-best warranty of three years/3,000 hours, and can be purchased outright or rented from an extensive equipment fleet.